NEWTON, MA--(Marketwired - Jan 24, 2017) - BRIDGE Energy Group (BRIDGE) today announced that DistribuTECH 2017 Conference and Expo has selected two company executives and their partner utilities to present views on modern utility grid operations, as well as lessons learned from real-world implementations from the New York REV project. Additionally, all BRIDGE executives will be available to discuss the company's offerings and services throughout DistribuTECH -- January 31 - February 2, 2017 -- at the San Diego Convention Center, San Diego, California (Booth #1031). "BRIDGE's distinctive OT/IT skillset brings a unique advantage to utilities undergoing grid modernization projects or seeking vendor-neutral counsel for technology investments," said Forrest Small, VP of Grid Optimization, BRIDGE Energy Group. "Our experts have helped organizations shape and execute their grid modernization efforts, consolidate multiple systems and gain real-time visibility with intuitive operational dashboards. We are proud to have been selected for our team's expertise and look forward to engaging with DistribuTECH attendees." As the leading annual electric power transmission and distribution conference and exhibition event, DistribuTECH brings together more than 11,000 utility experts from 78 countries to provide attendees with keen insights into the current status of grid modernization activities. Conference organizers selected BRIDGE Energy Group executives for two presentations. Pacific Gas & Electric Company's Eric Anderson, Manager, DSCADA/FLISR, will join Scott Grafelman, BRIDGE Energy Group's principal consultant, for Optimizing the Benefits of FLISR with a Near Real-time Management Dashboard. 2 February, 10:00 AM, Room: 32AB. As part of its "Improving Operational Performance" celebration, BRIDGE will offer a limited number of slots to test drive a Ferrari 458 Italia Spider or Lamborghini Huracan. To experience driving one of these $250,000 luxury sports cars while at DistribuTECH in San Diego, email: agility@BridgeEneregyGroup.com or call 508.281.5039. BRIDGE recently revealed its 2017 BRIDGE Index™ Utility Industry Grid Operations Survey that uncovered a 71% increase in organizations considering outsourcing their OT operations and support, which was fueled by 45% of utilities surveyed concerned about limited staff experience and pending employee retirements. Attendees should visit BRIDGE DistribuTECH Booth #1031 to view the full survey results and hear additional insights from our experts. 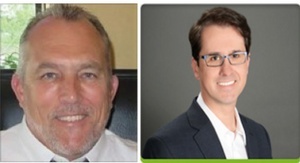 BRIDGE's Scott Grafelman (L), principal consultant, and Forrest Small, VP of Grid Optimization, will be presenting at DistribuTECH 2017 Conference and Expo.